I’m writing this blogpost sitting on the floor by my mother’s window. It’s where I spend an increasing amount of time these days. My mother, June, is 92 and in the later stages of Alzheimer’s. Physically she’s well. Emotionally and practically she’s completely dependent. I choose this place to sit when she’s having a snooze so that when she wakes she can see me or look past me safely to the garden beyond. Mum is very often disorientated and frightened. Waking from sleep can be a muddled, upsetting experience. My mother is the main reason why, almost two years ago, I said to my friend Nicci Gerrard: “If I were ever going to campaign about anything, it would be to ensure that the carers of people with dementia have the same rights as parents of sick children, to accompany them if they’re admitted to hospital.” Nicci had been telling me about her father, Dr John Gerrard’s, irreversible decline after his unsupported hospital admission in the spring of 2014. He only went in to have his leg ulcers treated but visiting hours were restricted and then there was a noro-virus outbreak. Would we have allowed ourselves to be turned away if it has been one of our children in hospital? Or course not. Yet when I look at my mother I see someone who is, in many complicated ways, less capable and more vulnerable than many children. I wouldn’t leave her in the hairdressers on her own, let alone a hospital! “You should do it,” said Nicci’s daughter Anna, who is a junior doctor. “You should do that campaign, both of you.” So, after John Gerrard’s death in November 2014, Nicci wrote a heart-breakingly thoughtful account of his last lingering months which was published in The Observer newspaper. Thousands of readers commented and shared. The Observer said they had never seen a response like it. We realised that so many people had similar experiences – and it was the people apparently “living well” with dementia who seemed to be most at risk. I felt even more determined that nothing like that should happen to my mother: the progress of the illness itself is bad enough. Why risk such an avoidable harm? I’d chain myself to the bed if I had to! That was eighteen months ago when Mum could still just about read and write. “Is this about me?” she asked. “Yes mum – and lots of other people as well.” “Then I want to say it for myself,” she insisted, and with great trouble and effort wrote rather a wonderful letter “To Hume It May Concern”. It was then we realised that our campaign wasn’t for the rights of carers of people with dementia; it was for the rights of the people with dementia themselves. I hope this doesn’t seem a meaningless distinction because it’s not. People with a cognitive impairment, like dementia, need additional help as a right – from their family and carers if they have them. Restricting willing carers’ help to traditional visiting hours is about as silly as saying you can only use your hearing aids between 2pm and 4pm in the afternoon! For those people with dementia who are without available family or friends, additional help must be provided by any other means possible. Carers are the “cognitive ramp” says Nurse Andy Tysoe. 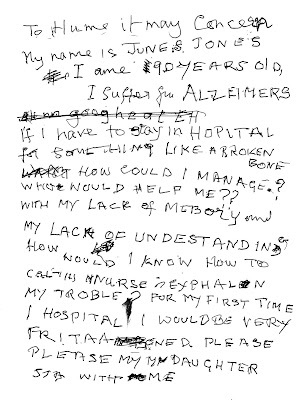 Dementia is, at the very least, a disability. Allowing carers’ access therefore isn’t simply just a matter of compassion and common sense, it’s also an issue of equality and human rights.